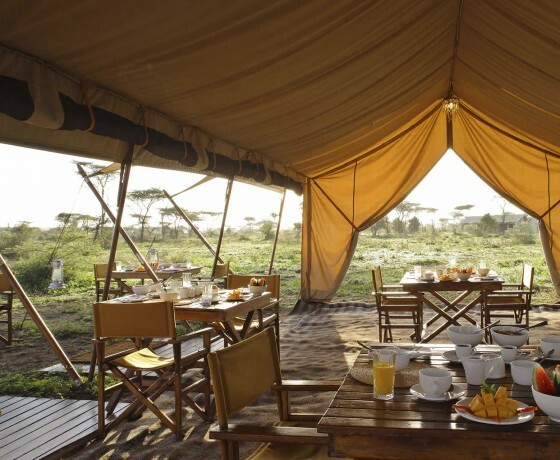 Whether you’re a safari novice or a complete wildlife addict, you simply cannot beat seeing the great wildebeest migration in Kenya or Tanzania. 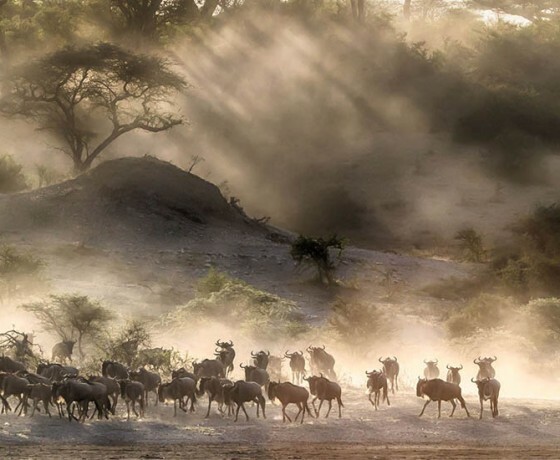 Whether you’re a safari novice or a complete wildlife addict, you simply cannot beat seeing the great wildebeest migration in Kenya or Tanzania. 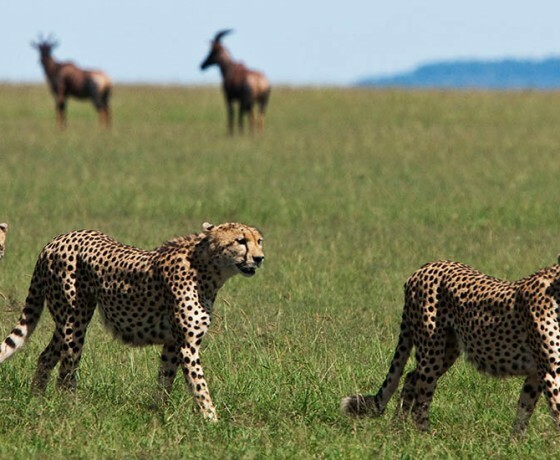 The sights, sounds and smells of such a vast number of wildebeest and zebra on the move, followed every step by hungry predators, is quite remarkable. 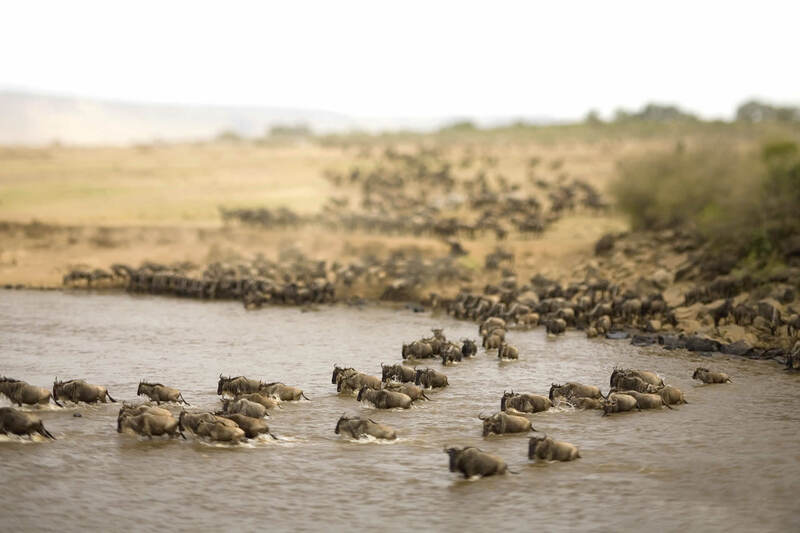 The famous river crossings offer the extraordinary spectacle of thousands of anxious animals channelled into tight crossing points, dodging the huge Mara crocodiles waiting in their path. 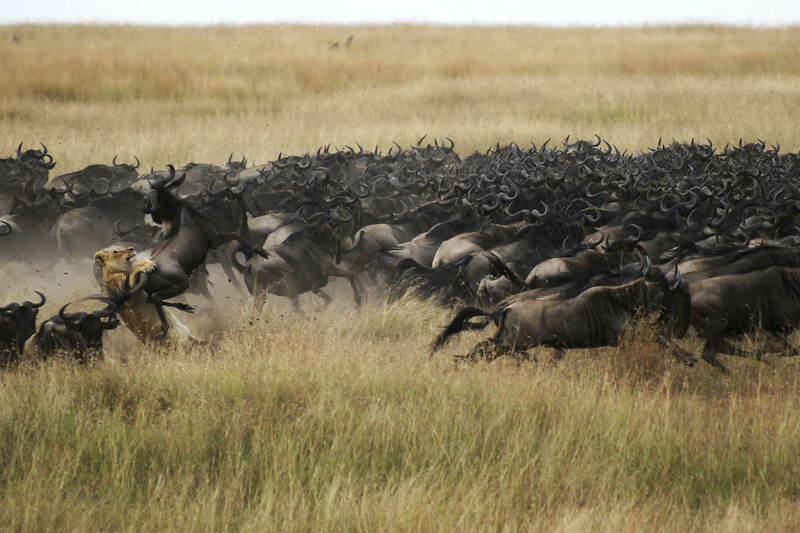 It’s an ancient battle of life and death, and one of the best wildlife shows on earth. 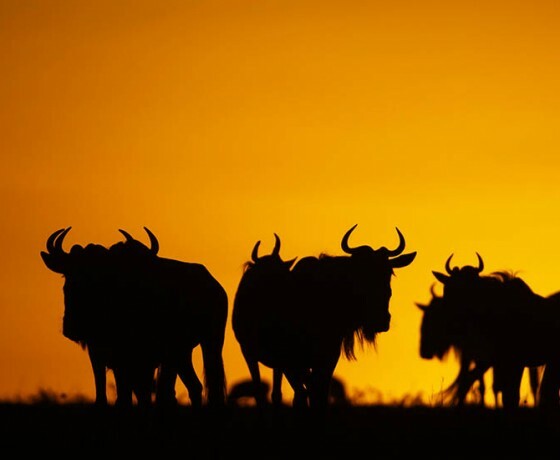 Although it has the appearance of an evolutionary calamity, the wildebeest is one of Africa’s most successful inhabitants, especially in the Serengeti ecosystem that straddles the Kenya / Tanzania border. 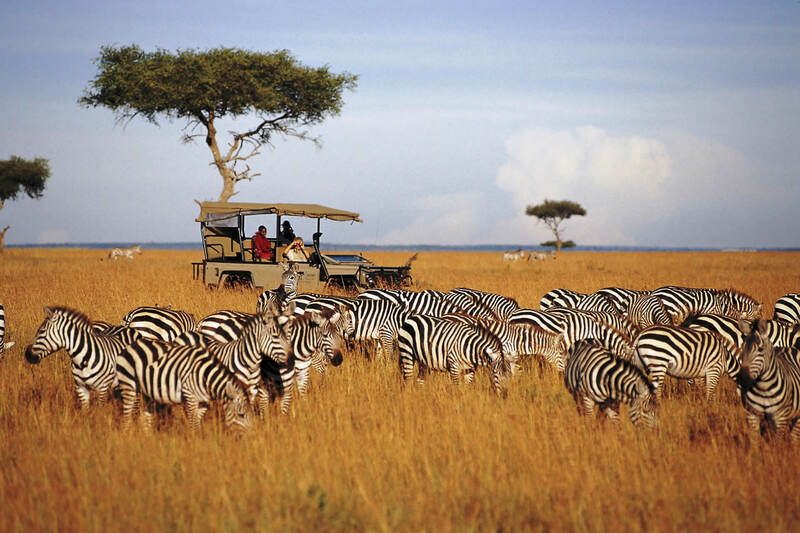 This is where the famous migration occurs, and where herds approaching two million head wander between the southernmost parts of the Serengeti National Park, the Ngorongoro Conservation Area, and the Masai Mara away to the north. 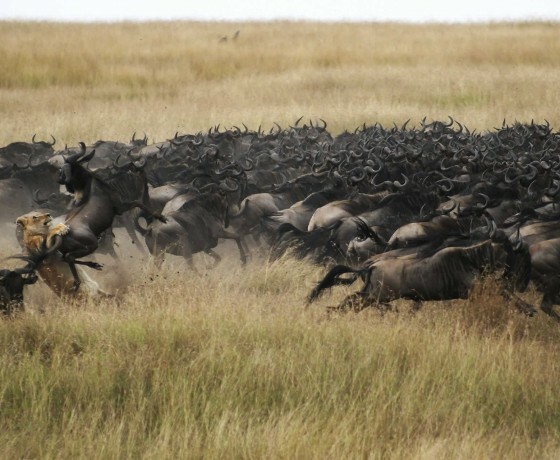 The migration follows a vague pattern year by year which tends to be influenced by rainfall and food availability. 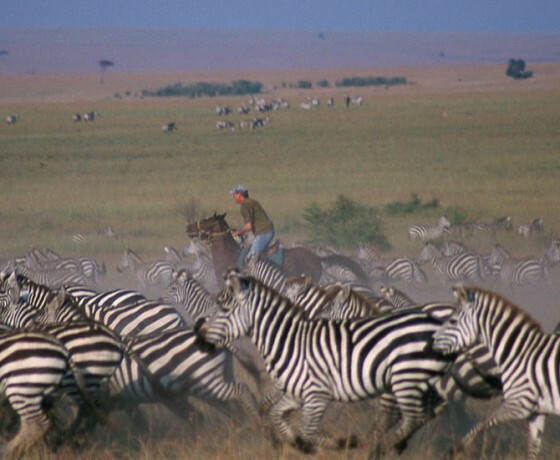 The herds, accompanied by several hundred thousand zebra, congregate on the short grass plains in the south just after Christmas to give birth and then make their way north via the west of the ecosystem towards Lake Victoria. During the journey they may travel 40 miles in one day in a particular direction and then do the same in the opposite direction the following day. This is often the case during the rainy season when thunderstorms may be very localised but also quite heavy. 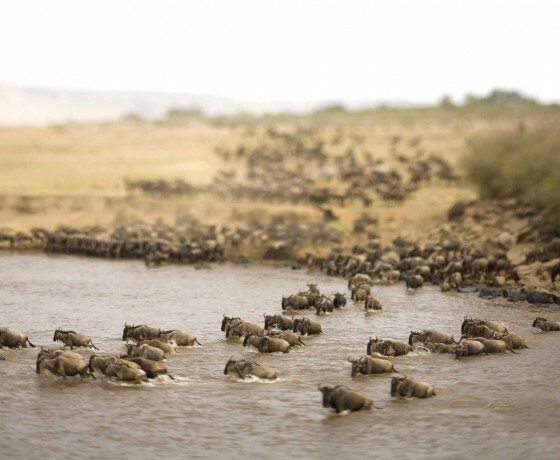 This footage captures the dramatic scene as thousands of wildebeest gather before plunging into the Mara River, crossing from the Serengeti in Tanzania to the Masai Mara in Kenya. 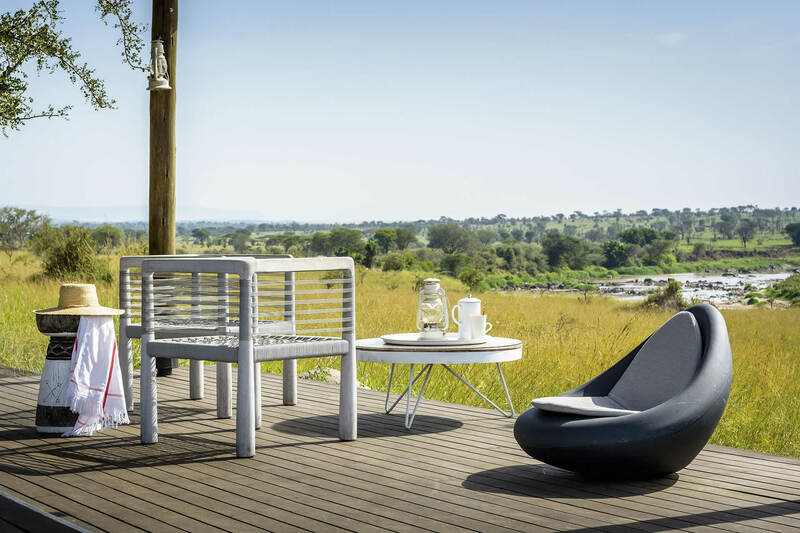 Video courtesy of Nomad Tanzania. 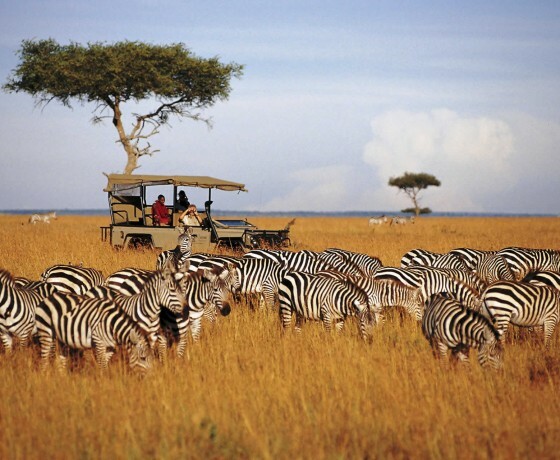 You’ll find the migration in Masai Mara in Kenya and the Serengeti in northern Tanzania. 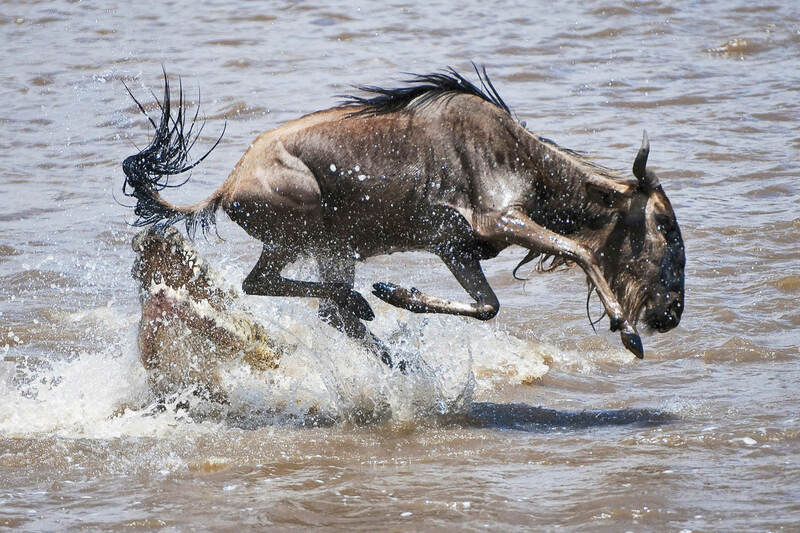 See our Wildebeest Migration Map PDF. 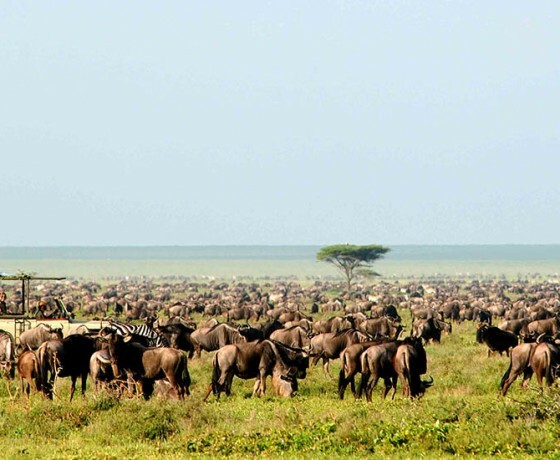 One and a half million wildebeest, along with 250,000 zebra and several 100,000 gazelle. 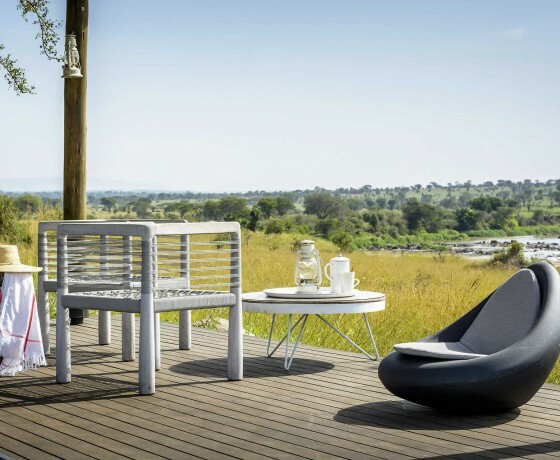 The migration travels roughly clockwise through the ecosystem, reaching its most northerly point between July and October, and the most southerly from late December to early March. It’s not regular or consistent; they are wild animals and do as they please. 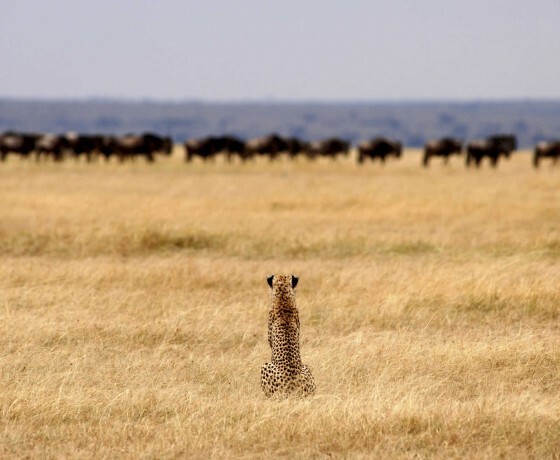 The easiest places to see the migration are in the Masai Mara, northern and southern Serengeti. 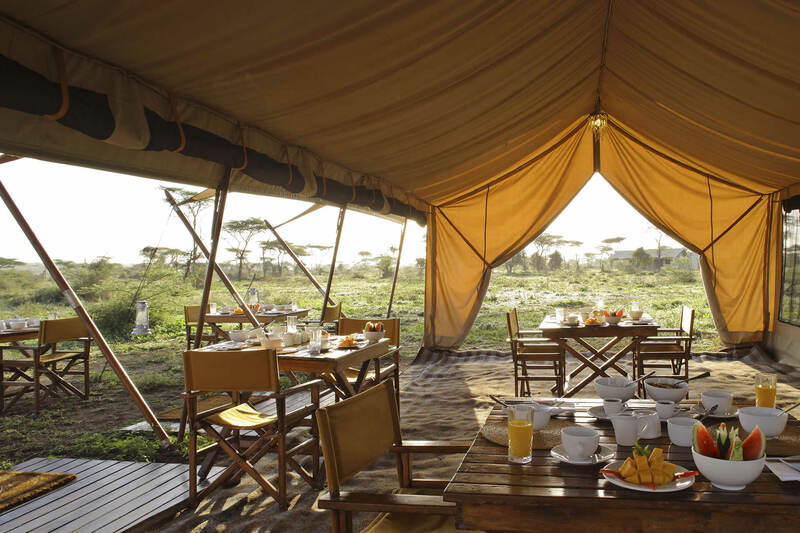 Several permanent tented camps in the Masai Mara are in the perfect position for famous river crossings which mostly take place between July and October. 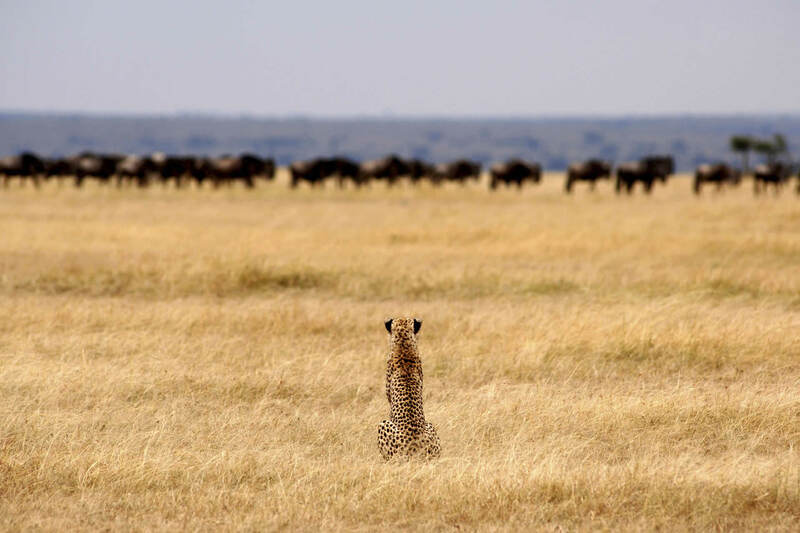 Apart from the predators, the resident wildlife tends to move out of the way when the herds arrive. 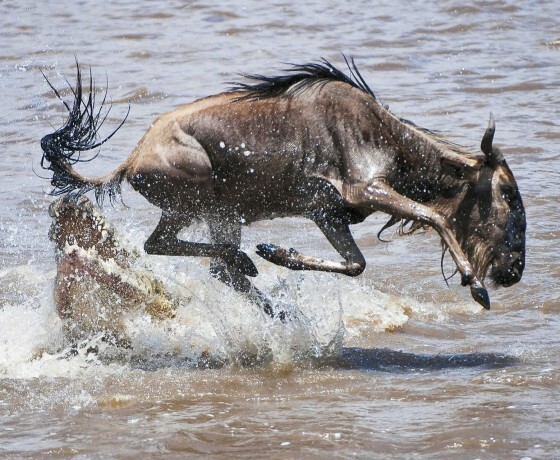 The migration is a year round event but the best times to see the action is during the calving season between January to March, and during the summer from July to October. Consider staying in a semi-permanent camp which will move seasonally, according to game densities.